Calcutta High Performance Coolers are built to last and keep ice much longer than average, everyday coolers. The super tough roto-molded exterior has up to 2" of insulation throughout the cooler. With an EVA lid seal, these High Performance Coolers will keep your contents cold for several days when packed with ice. Calcutta High Performance Coolers are built to last and keep ice much longer than average, everyday coolers. The super tough roto-molded exterior has up to 2" of insulation throughout the cooler. With an EVA lid seal, these High Performance Coolers will keep your contents cold for several days when packed with ice. Raised, non-slip feet will keep your cooler in place in the back of your truck or on the boat deck. An oversized drain plug makes emptying the cooler a breeze when the ice does finally melt. 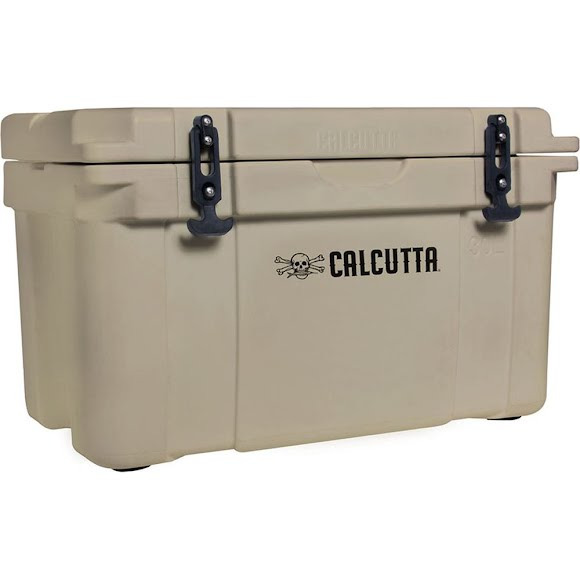 Each cooler comes with a removable food tray and every Calcutta High Performance Cooler includes a built-in ruler on the lid for measuring your catch of the day.